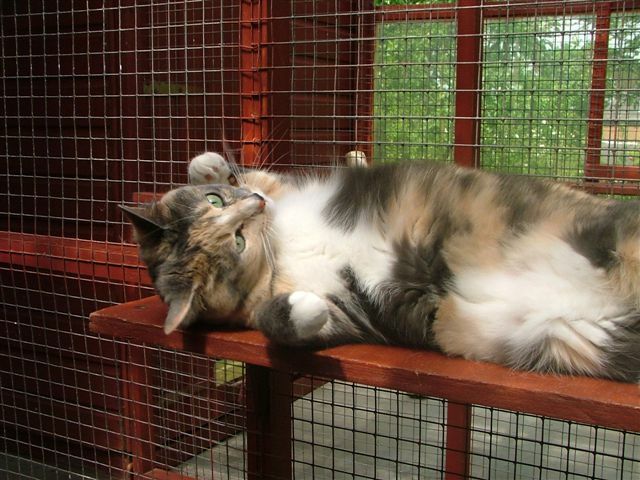 The cattery is set in a cottage garden where wildlife is actively encouraged. More than 53 species of visiting birds help keep the cats amused. As well as the squirrels, toads, bats, hedgehogs and badgers, moths flutter about the cattery at night attracted by the lighting and give the younger guests no small measure of excitement! Each chalet home has windows to watch the birds and bees from, there is a cosy duvet bed to sprawl over, and a furry nest to curl up inside. Each chalet has a large covered outside run with sitting shelf, scratching post and toys. Heating in the chalet is provided by a thermostatically controlled infrared dull emitter lamp which is especially wonderful for comforting elderly bones. 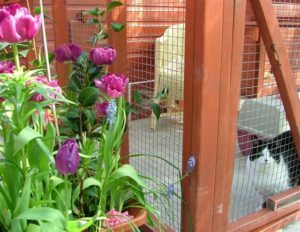 A space between each run ensures good ventilation, avoidance of contact between neighbouring cats and allows the cats a sense of space, preventing them worrying about other boarders’ proximity. Clear PVC barriers at the end runs ensure no contact with our cats or the geese! There can be no accidental contact between cats from different homes. Our chalets are in two sizes: for up to 2 cats from the same home and up to 4 cats from the same home. Adapted chalets are available to suit the less able guest, having low-level windows and shelves and electrical sockets for water fountains or heat-pads. Menus are devised to suit every appetite. We keep a very wide range of quality fresh, canned, sachet and dried complete foods. Prescription diets are available on request (at least 7 day’s notice please). Guests are fed at least twice daily and checked more often. They have cuddles and kisses if they like and each cat is groomed daily. We like to hear all our guests purring before they are put to bed at night, knowing all are content. Remedial grooming care and claw clipping are available on request, also routine worming can be undertaken for you – an often hated chore! Continuation of veterinary treatment can be assured. All cats must have current vaccination certificates for feline enteritis and cat ‘flu (RCP) to the recommendation of your vet, the course being completed at least ten days before the date of boarding. Please telephone if this is a problem. We understand that there will be special cases such as immune-suppressed cats where the vet may advise against vaccine. We regret that un-neutered males over nine months of age cannot be boarded as their stronger scent may upset the other guests.